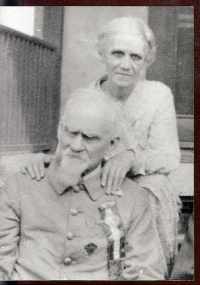 He was nearly 21 years old when he enlisted 15 April 1861 in Company B, 2nd Mississippi Infantry. He was at Sharpsburg with his Company on 17 September 1862. He was wounded as many as 9 times through the War, and was surrendered at Appomattox Court House on 9 April 1865. He was a Primitive Baptist minister in Page County, VA and in Washington, DC, where he was also assistant Chaplain of Camp 177, United Confederate Veterans. Basic information from his Compiled Service Records and his obituary in The Confederate Veteran Magazine.1 His gravesite is on Findagrave. Thanks to descendent Ronald Norton for the pointer to this soldier, and for an excellent late post-War photograph of him, probably in UCV uniform.